And...action! Foyle Film Festival director and programmer Bernie McLaughlin with Caoimhin McClafferty, Operations Manager at Brunswick Moviebowl. 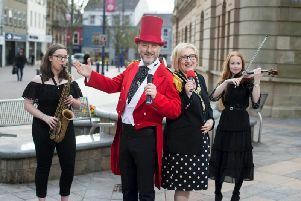 The Foyle Film Festival kicks off today with a string of A-list actors, directors, activists and industry experts set to arrive in Derry over the next 10 days. From today, over 100 films from around the world will be showcased in the Nerve Centre and in Brunswick Moviebowl. The programme includes premieres, features, shorts, animations and documentaries, in addition to industry workshops and Q&As with leading filmmakers. Oscar-winning actress Vanessa Redgrave will speak at the festival following a screening of her directorial debut, ‘Sea Sorrow’ in Brunswick Moviebowl next Sunday November 25. She will be accompanied by her son and the film’s producer, Carlo Nero. This year’s festival will commemorate 100 years of women’s suffrage by placing women’s stories at the heart of the programme. Meanwhile, Nerve Visual’s latest exhibition, ‘Speeches, Strikes and Struggles: Curating Conflict’, led by the Tower Museum, offers the chance for the public to view rarely before seen collections highlighting key moments in Northern Ireland from 1959 to 1974, and to go alongside with this, Foyle Film Festival are staging screenings and discussions, including Steve McQueen’s ‘Hunger’, and the powerful documentary ‘I, Dolours’, introduced by journalist and producer Ed Moloney, who will also take part in a post-screening discussion. Disney returns with the much-anticipated ‘Ralph Breaks the Internet’, along with classics ‘Bambi’ and ‘Dumbo’, and a 30th anniversary screening of ‘Big’. The best of homegrown and international talent will be celebrated with the festival’s Oscar-affiliated Light In Motion Competition. The 2018 winners will be announced at the Closing Night Gala at Brunswick by Vanessa Redgrave. The Shorts to Features industry day in the Nerve Centre on Saturday November 24 is an opportunity for filmmakers at all levels to network and hear from industry leaders. The full programme is available at www.foylefilmfestival.org.